Since graduating with a bachelor’s in political science last May (2018), Margaret Scarsdale has started a doctoral program in political science at Southern Illinois University Carbondale. She recently published a solo-authored article in Critique: A Worldwide Student Journal of Politics. Her paper discusses how political circumstances influence the issuance of documents by the President and provides greater insight into why the President might make the decisions that he does. During her time at the Southern Illinois University Edwardsville, Scarsdale was an assistant to Dr. Laurie L. Rice in the Undergraduate Research and Creative Activities program (URCA). She attributes much of her success as a researcher to her time in the program. “Being able to work with Dr. Rice in the program really enabled me to learn how to collect data in multiple formats and produce articles for potential publication,” commented Scarsdale. 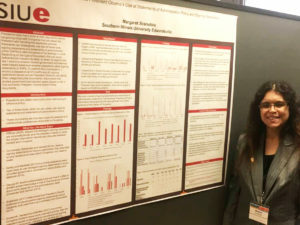 Before graduating from the University, she presented her research at the Illinois State University Political Science Conference and the internationally acclaimed Midwest Political Science Association’s meeting in Chicago. Now actively pursuing her doctorate, Scarsdale details how the program provided her with access to the skills required to do the research that she is currently doing in graduate school. “The URCA program is an invaluable resource that the University has to offer. My advice to students would be this–if you are planning on continuing on to another level of education, take advantage of the URCA program and work with faculty directly. You will have access to and learn the skills that you need in order to do research at a higher academic level” (Scarsdale). © Copyright This Month In CAS 2019. All rights reserved.